Cut cauliflower into florets about equal in size. Toss pieces with oil and place on baking pan in a single layer. Mix spices together and sprinkle evenly over cauliflower. Sprinkle with cheese. 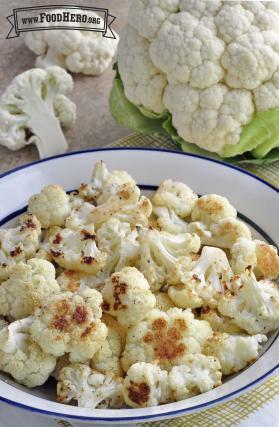 Roast for 30 minutes or until cauliflower is tender when pierced with a fork.